I have seen several recipes calling for blood oranges but I could not find any in the grocery store. However, last week as soon as I walked into the grocery store, they were staring me right in the face--calling my name and telling me to buy them! Having never tasted blood oranges before I felt four was a good number to start with. When I got home I began searching through all of the blood orange recipes I had saved and somehow scones came to mind. 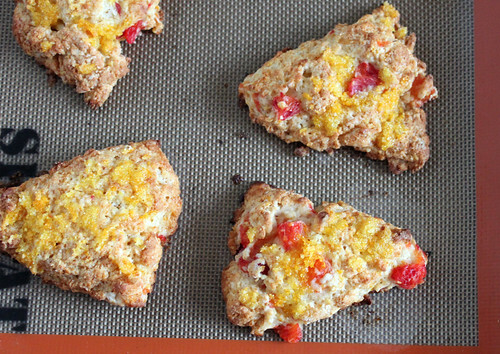 I began reminiscing about the wonderful scones I made last year--grapefruit honey yogurt scones. 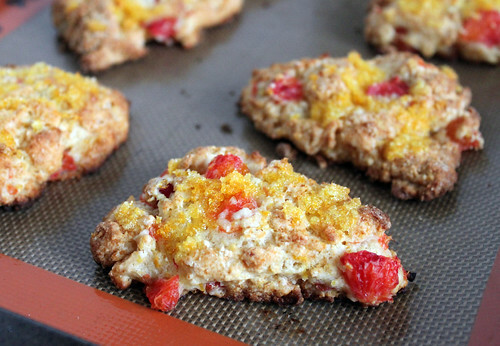 The best part about these scones, in my opinion, were the pieces of fruit that were gently mixed in. I knew I had to make them again with blood oranges. When I first cut into the blood oranges they had such a beautiful deep red--almost purple color. As soon as I tasted them I knew it was meant to be! It is a cross between a grapefruit and an orange; in this instance I only used the fruit from two oranges, but next time I will use at least three. These were the perfect morning breakfast. Additionally, you can do some of the prep work the night before to make things quicker in the morning. If you can find blood oranges, these are definitely a must make! In a measuring cup or small bowl combine yogurt, honey, and vanilla. In another small bowl, rub the blood orange zest and sugar together until the sugar is moist and fragrant. Pour the yogurt mixture over the flour mixture and pulse until dough is crumbly. Transfer to a medium sized bowl and fold in the coarsely chopped blood orange pieces.